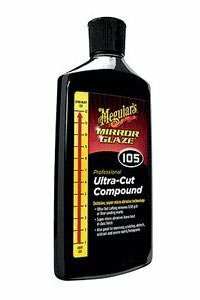 Meguiars #105 Ultra-Cut Compound contains Meguiar´s exclusive super micro-abrasive technology that uses ultra small abrasives, not big abrasives. This results in smoother paint, faster. Megs #105 cuts out a lot of finishing work! For professional detailers, it saves time and money. The VOC compliant formula is body shop safe, paintable, and contains no fillers. Use it on all types of paint, including today´s scratch-resistant clear coats. Having gained a strong reputation, its now available in much smaller sizes for those previously put off by the £30+ price tag of 32oz bottles. "Thanks for the particularly fast service. This is the second time that I have ordered from you. I thought that it was just a fluke getting my order delivered so quickly the first time but the second order confirmed that it was no fluke. You did exactly what you said on the tin, thanks very much and I hope to do business with you again."